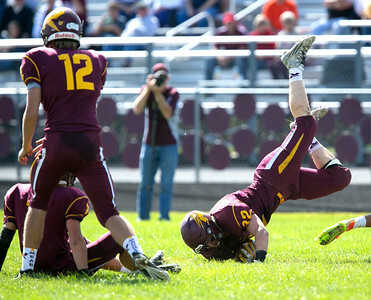 Daryl Quitalig - For Shaw Media Richmond-Burton fullback Joseph Dittmar (32) is upended after a tackle during the game at Richmond-Burton High School on Saturday, Sept. 19, 2015. Marengo won 28-14. 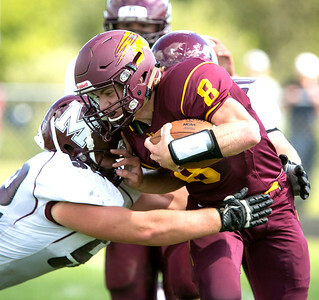 Daryl Quitalig - For Shaw Media Richmond-Burton quarterback Brady Gibson (8) is tackled by Marengo defensive lineman Chase Bough (52) on a run during the game at Richmond-Burton High School on Saturday, Sept. 19, 2015. Marengo won 28-14. 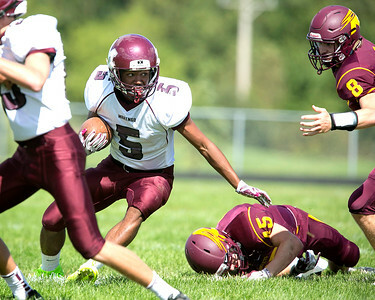 Daryl Quitalig - For Shaw Media Marengo running back Jarren Jackson (5) runs the ball during the game at Richmond-Burton High School on Saturday, Sept. 19, 2015. Marengo won 28-14. Daryl Quitalig - For Shaw Media Marengo's defensive back Jarrell Jackson (34) intercepts a pass late in the fourth quarter of the game at Richmond-Burton High School on Saturday, Sept. 19, 2015. Marengo won 28-14. 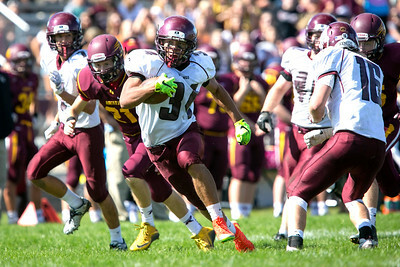 Daryl Quitalig - For Shaw Media Marengo's Jarrell Jackson (34) runs the ball for a touchdown during the game at Richmond-Burton High School on Saturday, Sept. 19, 2015. Marengo won 28-14. 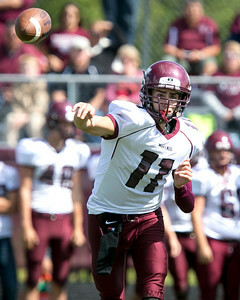 Daryl Quitalig - For Shaw Media Marengo quarterback Zach Knobloch (11) throws a pass during the game at Richmond-Burton High School on Saturday, Sept. 19, 2015. Marengo won 28-14. 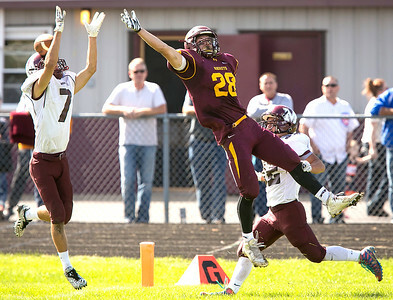 Daryl Quitalig - For Shaw Media Marengo defensive back Craiton Nice (7) misses an interception on a pass intended for Richmond-Burton running back Joseph Wolfram during the game at Richmond-Burton High School on Saturday, Sept. 19, 2015. Marengo won 28-14. 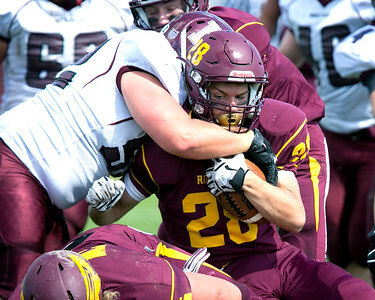 Daryl Quitalig - For Shaw Media Marengo defensive lineman Kwinn Velasquez (60) sacks Richmond-Burton quarterback Brady Gibson (8) in the fourth quarter of the game at Richmond-Burton High School on Saturday, Sept. 19, 2015. Marengo won 28-14. 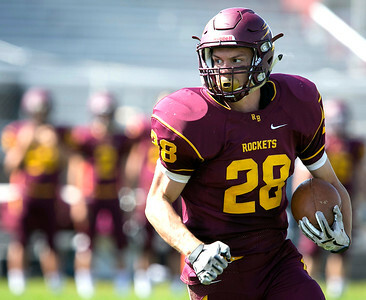 Daryl Quitalig - For Shaw Media Richmond-Burton running back Joseph Wolfram (28) runs the ball during the game at Richmond-Burton High School on Saturday, Sept. 19, 2015. Marengo won 28-14. 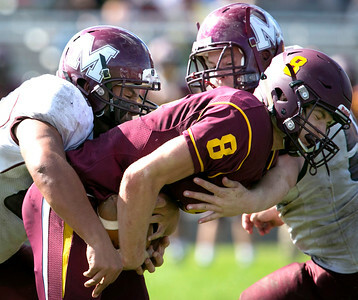 Daryl Quitalig - For Shaw Media Richmond Burton running back Joseph Wolfram (28) is tackled by Marengo's defensive lineman Chase Bough (52) on a run during the game at Richmond-Burton High School on Saturday, Sept. 19, 2015. Marengo won 28-14. 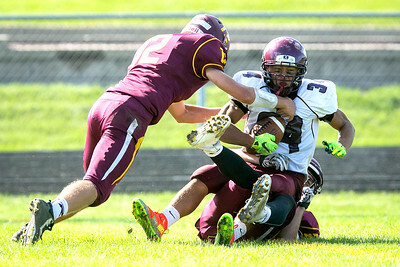 Richmond Burton running back Joseph Wolfram (28) is tackled by Marengo's defensive lineman Chase Bough (52) on a run during the game at Richmond-Burton High School on Saturday, Sept. 19, 2015. Marengo won 28-14.